Didn’t I just take this picture? Our end-of-the-year school picnic seems only days ago. Summer? Are we so close to saying goodbye? But it is true. 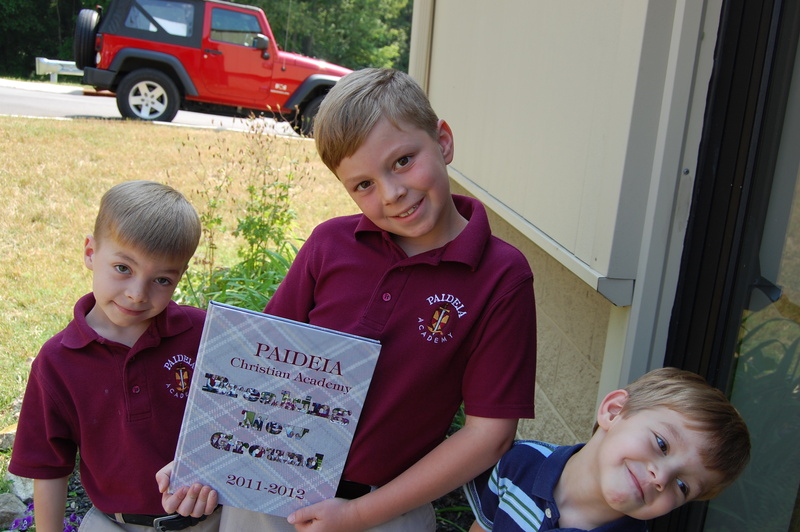 A new school year begins next week, as does a fresh chapter in our family. Our life is made of “School Year Seasons”. Isn’t it true? First Grade… Third grade… Preschool. Note To Self: Must invent a time machine. And make it stop. The Lord has been stirring an urgency in my soul. A pressing need to start fervently prayin’ up my babies. Sweet them. Gosh, don’t we just love our babies?? I want to invite you to pray with me. Grab your coffee and your knee pads. It is time to cover our kiddos head to toe. In prayer. Let’s name this series, “Praying Up Our Babies” for the new school year. What anxious thoughts come to you when thinking about the upcoming school year? I think about busyness. And the rush. I so want my boys to adjust well to their classes, to bond with a new teacher and make special little friendships. God has a plan for my babies. He has a good plan for your babies, too. Over the next two weeks, we will spend several mornings together, ushering our babies into the Throne Room of God. Asking on their behalf a number of requests. Here are a few topics that come to my mind. Help me brainstorm here. This will get us going. I’m sure we will think of more as we go. And email this to a friend. Invite her to pray along. Tell your hubby. Daddies can pray with us, too. Share this on Facebook or Twitter. And if you haven’t signed up to receive A Cup of Joe via email…top right corner up there. Let’s lock arms and storm the gates on behalf of our children. Leave a comment and let me know if we are in this together! I’d love to know what comes to your mind when praying up your baby. I will definitely be joining you on this one, not for my own babies but for the 18 babies in my class. They are a sweet bunch and need the same sweet prayers! Thanks Becky! Oh good, Emily! You could probably offer great insight on how we can be praying for teachers! Love you girlie. Great, Sue. I will be praying for the Molitor’s! xoxo Any specific requests? God is good and knows what we need!! I am trying to have my focused prayers for each kid and hitting all the little details!! Can’t wait! !